Description: Erect to spreading annual with stout culms to 2 m high. Leaves with ligule absent; blade to 18 mm wide, usually glabrous. Panicle 10–35 cm long, dense, erect or slightly nodding; racemes to 10 cm long. Spikelets 2 or 3 together, 3–4.2 mm long. 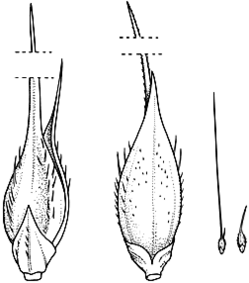 Lower glume 30-> 50% of spikelet length, acute to long-acuminate, 3–5-nerved; upper equal to spikelet, acuminate with a short point or an awn to 7 mm long, 5-nerved. Lower lemma similar to upper glume, 7-nerved, with awns 1–4 cm long. Fertile lemma narrow-elliptic, 3–4.1 mm long, apex scabrous with a short to long point, smooth, shining, pale yellowish grey at maturity. Lower palea subequal to lower lemma. Upper palea similar to fertile lemma. Grain oblong, 1.8–2.3 mm long, creamy yellowish to pale brownish. Distribution and occurrence: Grows in or beside ponds and streams. Other Australian states: Qld W.A.